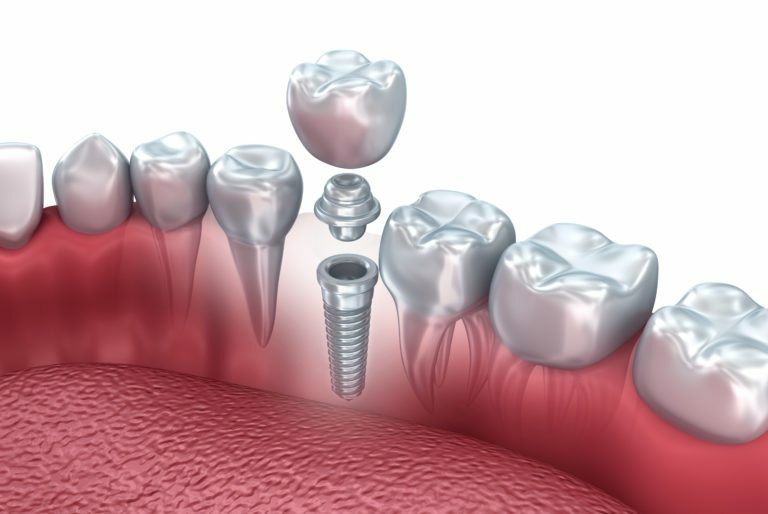 Dental implants are used to replace missing teeth. They are made of surgical-grade titanium and essentially replace the root of the missing tooth, or teeth. After placement, the surrounding bone grows and fuses to the implant thus making the implant a permanent anchor within the jaw. Once healed, the implant, or implants, can then be used to support crowns, bridgework, or removable dentures. When compared to other dental restorations, most patients report that implant restorations look, feel, and function more like natural teeth. Implants also prevent bone loss within the jaw, which is a typical occurrence following tooth loss. The placement of dental implants is a multi-step process that typically takes between 4 and 9 months to complete. The implant may be placed immediately following the extraction of a tooth, or may be placed after the extraction site has healed. The dentist may choose to use computer-guided technology to place the implant. This involves a special three-dimensional x-ray, which is then used by the dentist and a dental lab technician to design and plan the precise placement of the implant. A surgical stent is then used to guide the dentist during surgery. This method greatly minimizes any risk of damage to adjacent teeth, nerves, and sinuses. Once the implant is placed, a protective cap is used to cover the implant while the gums and bone heal. Implants need to heal an average of 3 months for upper teeth and 4 months for lower teeth, but this can vary from patient to patient depending upon the health of the bone in the jaw, as well as other factors.